KIARA: "Hey Vitani, aunque sea divertido ver lo tonto que se comporta, ¿no crees que ya deberías darle una oportunidad a mi hermano? Desde que te conoció no para de hablar de ti... y desde que vives en la Roca del Rey no para de seguirte. Creo que en serio le gustas. KIARA: "Hey Vitani, although it's funny to see how stupid he looks, don't you think you should give my brother a chance? Since he met you, he talks about you... and since you live in the Pride Rock, he doesn't stop following you, I think he really likes you. ¡Kion no es lo suficientemente bueno para Vitani!¡Bonito cuadro! I can imagine Kion being played by Haley Joel Osment, and Bunga being played by Jason Alexander, and come on, there are about 3 that are lovers of Kion. Tiifu, Jasiri and Fuli, so why not give Vitani a chance. Oh come on Vitani. 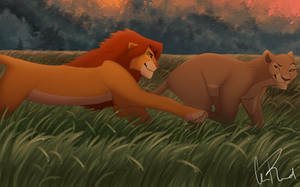 At least go on on date with Kion. Great picture. I feel very bad for poor Kion. Accidentally zoomed in and OH MY GOD Kions face! Why do I feel that Vitani looked over the world? Or.... is this a separate thing entirely, and is a character I have no context for? i would love to see an art of you showing vitani and kopa meeting again, but adults already. Awesome work on Vitani! I love her. I really liked how her hair is on her. It makes her stand out as one of the main characters. I might be wrong, but I think you colored her eyes purple. Her eyes are actually blue. Seeing her eyes as blue is mentioned on this link, Vitani - Disney Wiki - Wikia, under appearance. It was also shown on 2 other fan art on a different website [Link]. wut if it turns out to be a girl? Fantastic pic!! Wonderfullly detailed, and you drew Kion and the others superbly as adults! LOVE THIS!!!!! olle, que bien dibujas ¿porque nunca supe de ti? mi mente de fangirl esta gritando: DIME QUE ES KOPA! DIME QUE ES KOPA! DIME QUE ES KOPA! DIME QUE ES KOPA! DIME QUE ES KOPA! ¿Qué programa utilizas para hacer tus dibujos? Remind me of my childhood. Vitani is in love with Kopa. 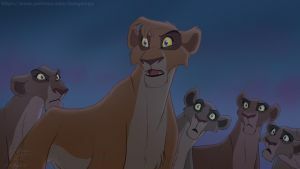 Kion should be with either Fuli or Jasiri. Yeah Kotani for LIFE!!!! Hope we see Kopa and Vitani together sometime soon. No reason really. "Small world"
Yeah, honestly I did expected to see you here as well. Awe this is very adorable and very well drawn. great job keep it up. Wow, that is wonderful work! Your style looks just like the movies; very professional! 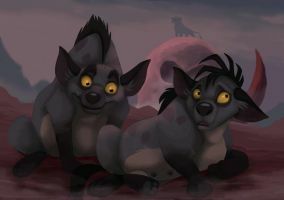 Vitani's not interested in Kion because she's in love with Kopa. no, that's just bad fan fiction.